Film offers one of the best opportunities to create an Enterprise project. You do not need to make films, it could be a screening event and a presentation/awards ceremony. I have delivered many projects that can be classed as “Enterprise”. 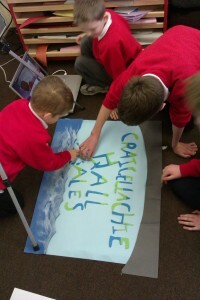 The children in the image on the left are producing an animation for Craigellachie Hall Tales. This was a superb reminiscence project where participants gathered stories about their local village hall from older members of the community. Interviews made the bulk of the stories but archive photographs, animations and artifacts were also presented in the final exhibition and presentation. The video below is an example of a transition video designed for nursery children about to attend their new school.